Okay, I understand that I’m not considered “old” by some people’s standards, but I have some complaints about aging that I need to air out. On Saturday, The Outdoorsman and I spent hours working in our pastures. 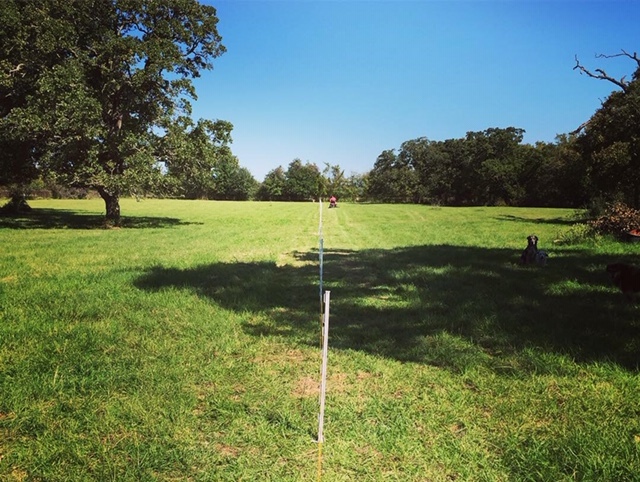 We lined out and installed 540-feet of electric fencing with three strands running along 28 posts across our pasture. It was not especially hard to install, but there was a lot of walking, bending over, and moving involved. While The Outdoorsman was installing the solar panel and magically wiring everything to work properly, I walked back and forth in the pasture dragging huge, dead limbs to the side where our burn pile is beginning to rise up like the Tower of Babel. The entire day was spent on the fencing of the pasture and the care of our 80+ animals on Green Acres. At sunset, I realized that I had forgotten to get anything out of the freezer for dinner so I made my way into our tool room and got some ground beef, sausage links, and chicken breasts to thaw out and grill for the coming week. As I was walking back into the house, I noticed an empty styrofoam cup on the ground and, to keep our 13 dogs from tearing it to shreds in the yard, I quickly bent down to scoop it up and that’s when it happened. I clearly felt it as the muscles in my lower back screamed for attention all at once and stretched past their normal level of elasticity. It felt EXACTLY like an overstretched rubber band feels except it was across my lower back inside my body. REALLY?!! Picking up an empty styrofoam cup?!! This can’t be happening!! I had been working outside all day long and THIS is the straw that broke the camel’s back?! I stood up and couldn’t quite stand up straight as I hobbled into the house. It was clear that this was going to cause problems for the foreseeable future. I’m actually thinking about fibbing to others about this unlikely scenario caused by an empty styrofoam cup. Telling them I hurt it when I decided to go rock climbing, skiing, or salsa dancing. Anything. I don’t want to admit that my body is just not as cooperative as it once was. I may have to tread lightly in the days to come. Except I can’t because, again, we have 80+ animals and, even worse, I’m a teacher. A middle school teacher, no less. Not that I don’t want to be a teacher, but when your back is hurting, it is tough to keep up your endurance all day with classes full of middle schoolers. They don’t understand that a teacher is actually human. I am currently sitting in my classroom awaiting our parents’ arrival to our 6th grade parent meeting tonight. Of course our parent meeting is tonight while my back is stiff and I am walking awkwardly. It’s also Halloween week which every middle school teacher in America knows should be a National Holiday. We are all bracing ourselves for the excitement and giddiness of the week. To be honest, I don’t have many complaints. Even though my body can make things challenging at times with its ever-increasing aches and pains and its allergies to unknown substances, I have no REAL complaints. God has gifted me with a body that is whole and healthy overall which I know is such a blessing compared with many other people. So, in the scheme of things, I know a temporary back issue is nothing compared to many more serious setbacks. It is as insignificant as the cup sitting in my yard that started this whole thing. I should have left it there for the dogs. No doubt about it.